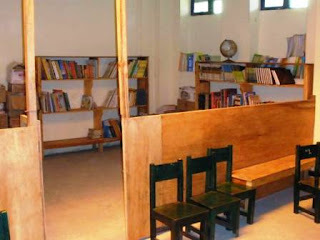 The 2012 Becky Fund trip to Peru is tentatively scheduled for April 13–27. Contact us for more information on volunteering. I'm proud to present the summer 2011 report from Team Peru at The Monterey Institute of International Studies(MIIS). Team Peru is a group of graduate students who work on current and potential development projects through The Becky Fund and the Andean Alliance for Sustainable Development. Students represent a variety of fields including; international environmental policy, public administration, international business, international policy studies, and translation and interpretation. Students dedicate themselves to a project and travel to Peru for two months in the summer and one month in January. A unique level of involvement is added however, while the students are in Monterey during the semester. The team works together at MIIS to bring the projects into the classroom. 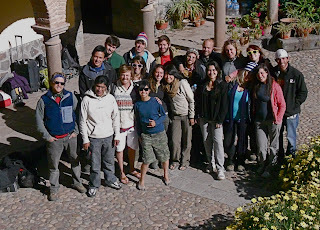 In the fall of 2011 the Becky Fund and Andean Alliance have been represented in classes such as; program evaluation, organizational sustainability, and grant writing. An entire class of 30 students in the systems thinking course used Team Peru as the case study for the duration of the course. These courses offer an amount of analysis and actionable recommendations usually reserved for large multinational NGOs with huge budgets. Team Peru is a unique student driven initiative that has added an extreme amount of value to The Becky Fund and the Andean Alliance, in 2011 we have benefitted from over 14,700 hours of professional volunteer service from these students. Thanks Team Peru, and keep up the good work! A new generation of change agents.. When you picture a group of high school students on a school trip what do you imagine? 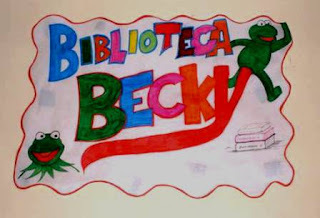 I have worked in Peru for The Becky Fund for over five years and had some life changing experiences. In June of 2011 a group of girls from Carmel High School arrived in Peru, and inspired me. This group worked all year long raising money to build 2 greenhouses in the remote community of Ccachin in Lares Peru. They held over a dozen fundraisers and attended meetings every week. They appreciated every moment of their trip because they had worked so hard to get there. 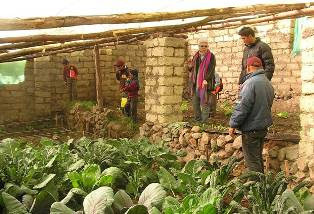 The girls and their chaperones spent 5 days in Ccachin physically working on the greenhouse. their work consisted of digging trenches, carrying rocks for the foundations and 40 pound bricks for the walls. Our final departure from Ccachin was delayed because they wanted to spend one more hour carrying much needed adobe bricks to the work site. Long bus trips, altitude sickness, food poisoning, sleepless nights on the floor, bug bites, and cut hands worked together to try to dampen the spirits of the Carmel group, however these discomforts could not even weaken the smiles on their faces. I am greatful to have been a part of such an empowered group of young people. This experience was not given to them. They earned it. Congratulations girls. This year we had another successful Becky Fund trip. Each year brings new experiences and surprises. This year we were entertained by some local dancers and musicians, a gift from my godson’s parents, Hugo and Celia; another night of dancing from some 8 year old school boys; a first year hair cutting ceremony for Genie’s godson in Choqueconcha (complete with the celebratory guinea pig dinner); the reading of the cocoa leaves; followed by an elaborate offering to the Pacha Mama (mother earth); and 2 nights of music from our friends Richard and Sondra. You might wonder when we had time to work! As always, this labor of love is made possible by all our generous donors and trip volunteers. Thank you once again from the thousands of families and teachers that you have supported for another year. Each year the Becky Fund exists, it develops and grows. It makes each trip change significantly from the time before. The work of Aaron Ebner, and the groups he has organized, now resonates through the Sacred Valley as we see green houses at schools popping up, libraries, and kitchens, all results of their hard work. The truth is that no matter how many thousands of notebooks we pass out each year, there will still be multiples of thousands more children left untouched by this work. It is daunting to imagine so we try to focus on what we can do, and take pride in the differences we can make as we begin our journey each year, and set new goals and challenges for ourselves as we set out to do this work. Dinny purchased 5000 notebooks, significant school supplies for the teachers, and soccer and volley balls for the schools we planned to visit. We brought with us toothbrushes, toothpaste, donated clothing, soaps, shampoos, and toys. We each carried the maximum we could travel with. 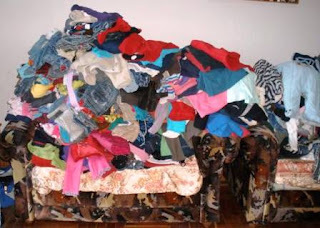 Sorting it all out began at the house in Calca. The fist week we traveled further than we had gone before, to Lares. The Mayor of this city provided our transportation so we loaded up and worked out of Lares for three days to reach schools we had never been to before. This was a poor, needy, but most gracious community. We were welcomed with open arms and the Mayor did all he could to make our trip successful. He is a person dedicated to the education of his people's children, the wellbeing of his culture, and the success of his town. We all agreed that we hope he wins the next election. The roads we traveled each day are made of dirt and are barely wide enough to accommodate the large open back truck we ride in. It takes hours to travel to these remote schools and we were never certain whether or not the school would be open, teachers would be in attendance, or children would be present. This year we were lucky as only one school we traveled to was closed, and only one other missing children and a teacher due to illness. We were always welcomed by smiles and gratefulness. One teacher told me that they were so short of pencils that she had to break pencils in half so that all the children could have a writing tool. As I handed out pencils I noticed several children holding fragments of a pencil that in our country would never be considered functional as something to write with. Toothless smiles, on chapped cheek faces, caked with soil and soot from open fire cooking greeted each and every one of us. We were often given hugs or led to the classroom by small dry chapped hands to hear a poem or a song. As I looked down on their small heads I could see lice crawling in their newly parted hair, in pigtails or braided. I thought of the shampoo we were leaving with them and wondered if next year we should bring de-licing products. 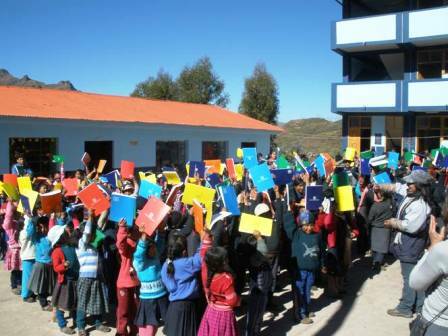 In the course of two weeks the group left 5000 notebooks, 4,278 of which were personally handed out, left supplies with 206 teachers and visited or gave teachers supplies for 82 schools. We also left funds with one school to fix a roof and provided a scholarship to three orphaned children. 2011 Volunteers: Dinny Bomberg, Leonard Jimenez, Kent and Alison Peña, Genie Rogstad, Gail Ambrosius, and Ann Woolf-Smith. Many thanks to the Diversity Council at Kraft Meadows Middle School in Caledonia, Michigan for organizing a fund-raiser for The Becky Fund and raising $420 dollars for the children of Peru. 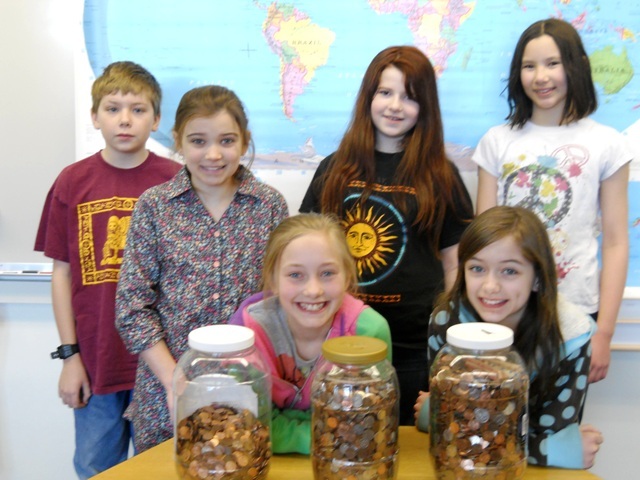 Pearl Creek Elementary School in Fairbanks, Alaska, where Becky and Mike's nieces go to school, ran a penny drive for The Becky Fund and raised $485 for the children of Peru! Thanks very much to the students, parents, and teachers for participating and a special thank you to the Student Council for organizing the penny drive. 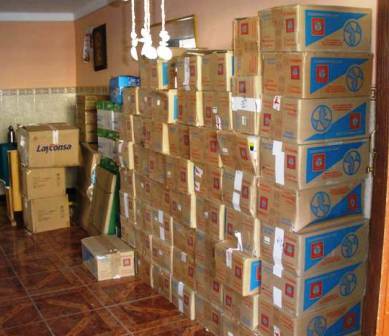 This money will provide school supplies for about 250 children in 10 schools. The trip has been moved again to a later date May 6–20.